A new report from a British Columbia think tank reveals the inside story behind B.C.’s successful tax on CO2 pollution. 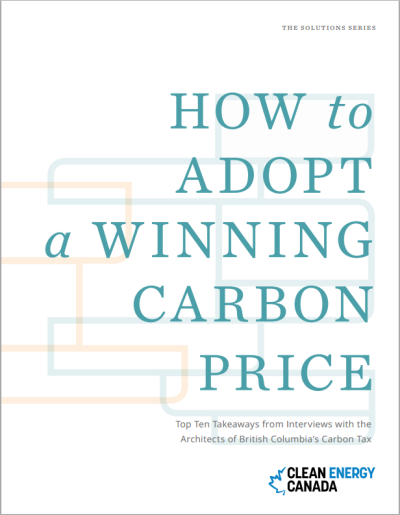 “How to Adopt a Winning Carbon Price, Top Ten Takeaways from Interviews with the Architects of British Columbia’s Carbon Tax,” published by Clean Energy Canada, draws on extensive interviews with senior government officials, elected representatives and a broad range of experts who helped shape or respond to this groundbreaking policy. British Columbia inaugurated its carbon tax on July 1, 2008 at a rate of $10 (Canadian) per metric ton (“tonne”) of carbon dioxide released from coal, oil and natural gas burned in the province. The tax incremented by $5/tonne annually, reaching its current level of $30 per tonne of CO2 in July 2012. At the current U.S.-Canadian dollar exchange rate (1.00/0.80), and converting from tonnes to short tons, the B.C. tax now equates to around $22 (U.S.) per ton of CO2. In the tax’s initial four years (2008 to 2012), CO2 emissions from fuel combustion in British Columbia fell 5% — or 9% per capita, considering the province’s 4.5% population growth over that span. [NB: These figures are revised downward from the original version of this post; see editor’s note at end.] During the same period, emissions from the rest of Canada increased slightly. Revenue from the tax has funded more than a billion dollars worth of cuts in individual and business taxes annually, while a tax credit protects low-income households who might not benefit from the tax cuts. Also since 2008, British Columbia’s GDP has grown slightly faster than the rest of Canada’s, according to a post last year by two Canadian academics and an industrialist, published by the World Bank. (The growth rates, 1.7% for B.C. and 1.3% for the rest of the country, cover the entire 2008-2013 period and thus reflect the financial crisis.) In a particularly nice twist, public support rose from 54% in 2008 to 64% in 2012, even as the tax increased stepwise each year from 2009 to 2012. The most recent poll shows 58% of voters support the policy. CEC’s interviewees repeatedly cited strong leadership from Premier Gordon Campbell and a clear, well-coordinated information campaign by finance minister Carole Taylor. Building on public support for government action to curb climate disruption, Campbell and Taylor proposed a simple upstream tax pegged to the carbon content of coal, oil and natural gas, in February 2008. They promised that the tax would be revenue-neutral, with all proceeds returned to the public through tax cuts, credits and direct payments. Some interviewees reported that the term “revenue-neutral” led some citizens to mistakenly believe that they would get their own carbon tax payments returned. Of course, for the carbon tax to do its job of disincentivizing fossil fuel use, tax revenues must be returned without linkage to individuals’ fossil fuel consumption. Campbell and Taylor chose to use the revenue to cut a range of other taxes; B.C. does not use the carbon levy to fund government programs. (In practice, B.C.’s carbon tax has been slightly revenue-negative because of administrative costs.) The revenue has allowed British Columbia to cut its corporate tax rates, which interviewees suggested was one reason B.C.’s economy grew faster than the rest of Canada. While revenue-neutrality was a selling point initially, Taylor suggested that it may no longer be as important to the public now that the carbon tax concept has proven successful. In designing the program, Taylor resisted pressure to carve out exemptions and loopholes. Her insistence on applying the tax across-the-board to all CO2 emitters apparently solidified public perception that the tax would be fair and effective. Campbell’s government had authority to implement the tax administratively, without a vote by the legislature or a popular referendum. Campbell cast the tax as a simpler, more transparent and business-friendly alternative to cap-and-trade which had been advocated by the more leftist New Democrat Party. In the 2009 election, Campbell campaigned on his successfully-implemented carbon tax; NDP’s opposition to it reportedly helping swing the election toward Campbell. The CEC report also suggests that the tax’s low starting price of $10 per metric ton boosted public acceptance; and, moreover, that announcing and sticking to a pre-announced annually-rising price trajectory helped households and businesses plan and adapt without undue hardship or disruption. CEC’s interviewees caution advocates not to oversell carbon taxes, pointing out that complementary policies are needed to reduce CO2 emissions. This is particularly true for a carbon tax at the provincial or state level, since concerns over business flight and border “leakage” make it impracticable to raise the tax to the triple-digit level at which a third or more of emissions would likely be eliminated. Not surprisingly, B.C.’s carbon tax architects also exhort advocates to gird for “vocal and not necessarily fact-based” opposition; organizing and informing supporters about the effectiveness and simplicity of carbon taxes was essential to B.C.’s success. Editor’s Note: The original March 3 version of this post stated that British Columbia’s carbon emissions from fuel combustion fell 16% from 2008 to 2014. We based that assertion on a table in a Sept. 2014 World Bank blog post that purported to show a 16% drop in per capita consumption of petroleum products subject to the BC carbon tax. (We used petrol consumption as a proxy for all fossil fuels, which may have been reasonable for BC; however, we omitted the per capita qualifier.) Subsequently, prodded by a commenter, we tracked down official provincial statistics on emissions of CO2 and other greenhouse gases, in this spreadsheet. Figures therein indicate that combined CO2 emissions from “stationary combustion sources” (electricity, heat, manufacturing, residential, commercial, etc.) and “transportation” (domestic aviation, road transport, railways, domestic marine, etc.) were 46,111,000 tonnes in 2008 and 43,772,000 tonnes in 2012, for a decline of 5.1%. Population grew 4.46% over the same period, implying a per capita drop in CO2 emissions of 9.1%. Pending official data later this year for 2013 and 2014, we give more credence to the smaller but still impressive declines for 2008-2012 noted here than to the 16% per capita decline for 2008-2014 that we reported (incompletely) earlier. — C. Komanoff, March 10. Wow, impressive results in such a short time. British Columbia cuts its CO2 emissions 16% in 7 years, grew its economy, And the politician who did it got re-elected? THAT is a story! If we did this globally, we’d have a shot at beating global warming. I hate to be the bearer of bad news, but the BC model is in fact a failure. I do promote the taxation of carbon. However, tax revenue needs to be used to curb Carbon emissions – not recycled through Income tax cuts. There are several government reports relating to the “inventory of GHG’s.” These reports are prepared by Environment Canada and the Ministry of Environment of B.C and they are based on the accepted methods of the IPCC. BC has released several reports regarding these GHG emissions. The latest (2012, as 2014 is expected later in 2015) clearly graphs the 3-year trend from 2009-2012. In Table 2, you will see how emissions have increased – most notably in the transportation sector (the leading cause of GHG emissions – not oil sands, but gasoline consumers). These statements of BC reducing their emissions by 16% are false. Believe me I WANT them to be true, but show me the evidence. 16% is a media created number. This article quotes the 16% from another article, that does not state the source. Why? * Based on the 2014 progess report by the Ministry of Environment published is early 2015. [please Google it]. Carbon tax dollars need to taken from the GHG emitters and given to the GHG reducers. That’s the only way to reverse climate change. Climate change IS REAL. Climate change existence is based on GHG emissions. It is only logical to conclude that to prevent climate change we must prevent GHG emissions. Thanks for your support for carbon taxes and for your comment. BC’s model will need to “go global” — a state or province can’t offer much inducement for trading partners and neighbors to cooperate. Fortunately, on a national level, WTO rules encourage “harmonization” — allowing nations that adopt carbon taxes to collect the carbon taxes on imports from nations that don’t. “Pay or play,” if you will. You propose carbon tax revenue to fund renewables and efficiency. Intuitively, that makes sense: Double the “price spread” created by carbon tax by taxing dirty energy while subsidizing cleaner alternatives. In practice, we know a lot more specifically what we DON’T want (CO2 pollution from burning fossil fuels) than what we DO want. If we had one overwhelmingly superior energy source ready to replace fossil fuels, subsidizing that perfect replacement might make sense. But it’s more complex: we have promising alternatives: wind, solar, hydro, geothermal, etc. We also must encourage more innovation and investment. And we must reduce energy demand, encourage efficiency. The perverse incentives created by (and political entrenchment of) ethanol subsidies (that do nothing for climate or very little even for “energy independence”) should give pause to anyone considering more energy subsidies. Instead, the Carbon Tax Center recommends a tax on carbon pollution that notches up, year by year, in a predictable, pre-announced way, so that investors in all clean energy and efficiency options can bank on that rising price trajectory, encouraging them to replace “incumbent” dirty energy. We feel that BC’s step-wise $5/yr price escalator, along with Gordon Campbell’s decision to revenue return via tax cuts and direct distribution, offers a model of simplicity and clarity as well as political savvy. BC’s model needs to be replicated globally and its price trajectory needs to keep marching upward. Thanks for your comment and for your book, “The Case for a Carbon Tax” which we reviewed here. I tend to agree that simplicity is preferable in carbon tax design; transparency about the revenue seems to have helped BC build public acceptance. But I also am impressed with the economic efficiency argument for using carbon tax revenue to reduce other taxes. Ideally, we could move beyond the debate about whether to enact a carbon tax in the US, and move to a healthier debate about how to spend or distribute the revenue.